Our Most Popular Air Tool -- Every Bodyman's Favorite! 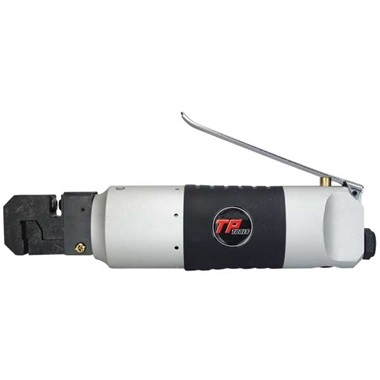 If you've ever cut out a rusted piece of quarter panel, fender, hood, floor pan, or trunk bottom, you know you need this tool! 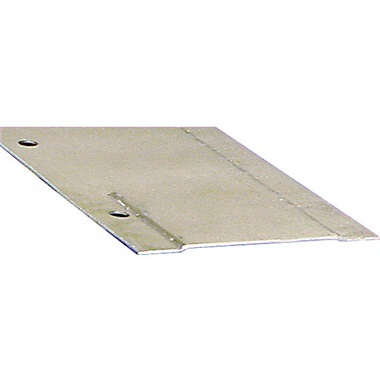 Produces a 1/16" offset flange on the original metal so patch or replacement panel will fit flush with the original surface. Also punches a 3/16" hole in metal for tack welding. Head swivels 360°. Crimps and punches up to 16 gauge steel. Requires 4 cfm @ 90 psi. 2-1/2" diameter, 9-1/2" long. We have only used the punch feature. Making 16 gauge floor pans and firewalls on our race car and it works great. This is really thick material and it handles it easy. Works as described. Very well built. This tool makes a nice clean flange at juts the right depth for overlapping joints. 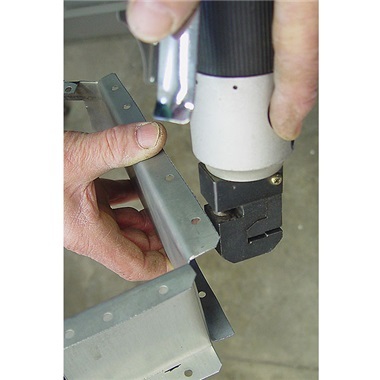 The hole punch effortlessly make holes for plug welding but the hole could be a little larger for a good weld. Great tool for metal fabrication. It's a well made tool that works as it should. Happy customer.